Left Alive – the survival/action shooter set in the Front Mission universe – will be available for the PS4 and Steam on May 5th, 2019. Either the localization didn’t take as long as expected or Square had the game ready to ship alongside its Japanese counterpart. I’m thinking it’s the former though; if it was finished early on, there would be no reason to stager the release. Of course, that’s just speculation. 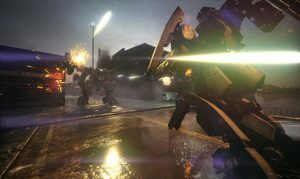 Whatever the case, those looking to get their hands on Left Alive won’t have a terrible wait on their hands. Square is promising extra goodies (ammo packs, light body armor, etc.) for those who purchase a physical Day One Edition of the game. While I’m not a fan of this sort of thing – there are exceptions – you can’t go wrong with buying a physical copy of the game. There’s also a collector’s edition that offers the same content, the typical accessories (like a Steelbook case) and a Volk Action figure. All for the suggested retail price of $159.99. Whatever you decide to do in terms of purchasing Left Alive, make sure to keep it locked here for more gaming related news!